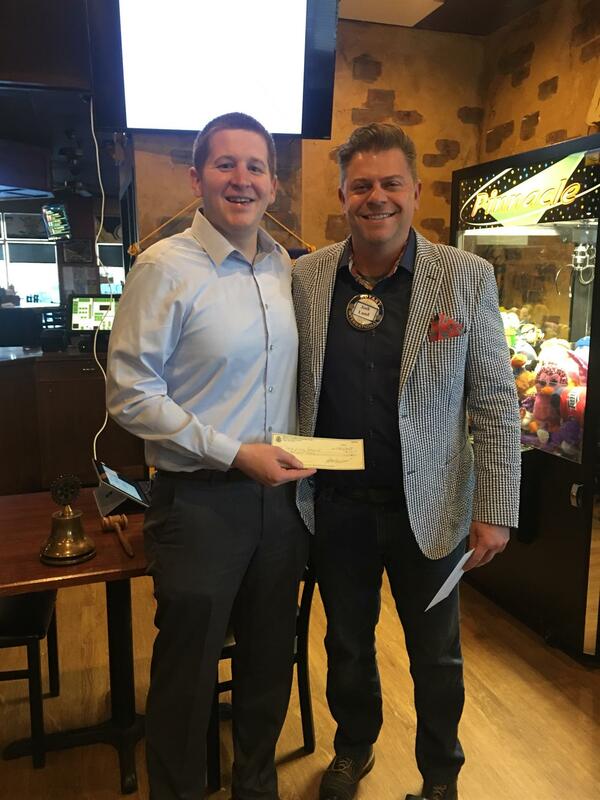 Marcus Franzone of Twin Cities Rotoract accepts the club's check for $500 from President Josh Lund. The club was key sponsor of TC Rotoract's recent Spelling Bee(r) fundraiser. Meeting Responsibilities April 10: Sergeant At Arms- Scott Lund. Invocation- Lois McCarron. 18 members, Visiting Rotarian Marcus Franzone, and guest Craig Dahlen heard and participated as Crime Prevention Specialist Courtney Miller and Patrol Officer Josh Norgaard of the Fridley Police Deptartment gave the group a refresher Heartsafe training session, demonstrating resuscitation and walking through the use of an AED. 4th quarter dues invoices will be emailed shortly. Gordy Backlund announced the decease recently of Bill Beery, the last surviving charter member of the club (the club was founded in 1963). Bill was 103 at the time of his death. He was the former president of Fridley State Bank, now Wells Fargo. The 2019 District Conference of Clubs is scheduled for April 11-12 at Mayo Civic Center in Rochester. Details and registration information are at https://rotary5960.org/sitepage/2019-conference-of-clubs. The Allina Health/Bikes for Kids bike giveaway will take place on April 13 at Stevenson Elementary School in Fridley. In lieu of the 501 meeting scheduled for April 17,the club will offer a normal breakfast on that date, and instead will attend the 20th annual Columbia Heights Interfaith Prayer Breakfast on Tuesday, May 7th at Murzyn Hall, 530 Mill St NE.. THE PRAYER BREAKFAST REPLACES THE MAY 8 CLUB BREAKFAST. This interfaith, multicultural event will begin at 7:00 AM, with a catered Mexican breakfast at 7:30. The program will be provided by the homeless-youth agency Hope 4 Youth, and will conclude at 8:45 AM. Anoka County Senior Expo 2019 will be held on Saturday, April 27, from 9 a.m. to noon at Lord of Life Church, 14501 Nowthen Blvd., Ramsey. Breakfast, massages, blood pressure checks. Free. The next club board meeting is on Wednesday, May 1, at 9:00 a.m. at Fridley Civic Center. HeightsNEXT Community Foundation will hold its annual fundraiser, Cheers for Beers, from 6-9 pm on May 17 at Murzyn Hall, 530 Mill St NE in Columbia Heights. JOINT BREAKFAST: We will breakfast with Blaine-Ham Lake Rotary at TPC on Wednesday, June 5 from 7:30 to 8:30. TPC is at 11444 Tournament Players Pkwy, Blaine. Mystic Lake Center, 2400 Mystic Lake Blvd, Prior Lake.